Ourtravelcravings.com is a blog where we, a travel craving couple from India, share our travel experiences and travel desires! Kalka is a small town but it is famous for the toy train which originates from here and ends at Shimla - the famous tourist spot often quotes as the queen of hills which also happened to be the summer capital of India during the British reign.This toy train narrow gauge rail was planned and put into place by the Britishers. The rail route is popular because if its scenic beauty and picturesque landscapes as well as the numerous tunnels in its way. Indeed it is a joy ride! The number of trains on this route are limited and the number of coaches too are mostly fixed. So one has to plan well in advance during the tourist (read:summer) season because of the rush. The time table for this train can be found at the IRCTC website. Make sure to enter SIMLA instead of Shimla to find this and other trains from/to Shimla. It's funny how the station name of such a famous tourist destination in India is perhaps 'misspelled' on India's only official railway ticket booking site. When we searched for the first time for trains from/to "Shimla" we were shocked to get ZERO results. Only later did we realise that we need to search "SIMLA"!! Bookings commence one month before the date of journey for this particular train (and NOT four months as is normally the case in Indian railways). Most passengers/tourists arrive Kalka from Delhi boarding the Kalka Mail which originates from Howrah. This train departs from New Delhi railway station at around 21.20 hrs and arrives Kalka early in the morning at 04:30 hrs. 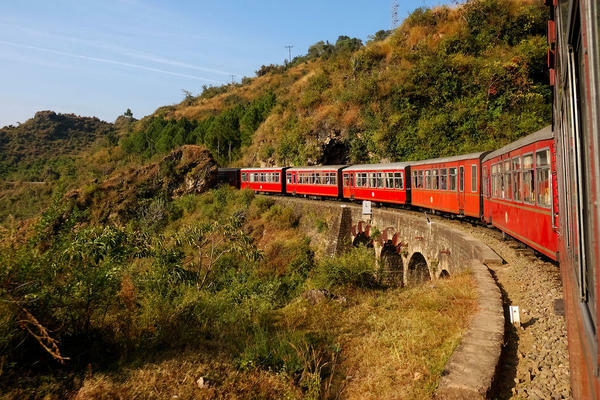 This train is the perfect choice since it reaches us Kalka just in time to board one of the three toy trains that run daily morning from Kalka to Shimla. 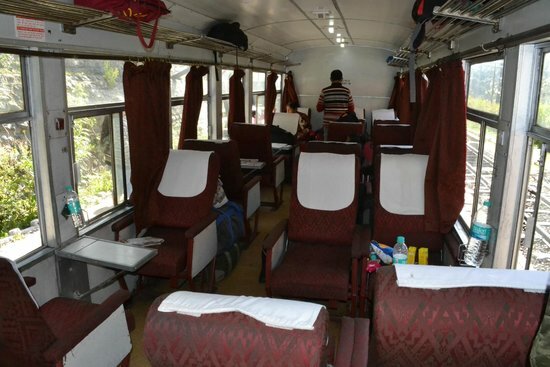 One thing to take note of is that out of all the trains from Kalka to Shimla, the Shivalik express, which departs each morning at 05:20 Hrs, is the official connecting train for the Kalka Mail. This means that the Shivalik express won't leave Kalka until the Kalka Mail from Delhi reaches Kalka in the morning. And well, that is the reason the toy train almost always departs late. The average delay is around 2 hours as mentioned on a popular website giving train details. From our own experience we can say that perhaps they add coaches or trains if the rush is considerable and of course if you get lucky. We had got lucky by the way! Our booking was showing a waiting of 21 until previous night. It was only when we were boarding the Kalka Mail from NDLS (New Delhi) station the previous night, we got the ticket confirmation message. It was a blessing in disguise since we had no Plan B in case the ticket wasn't confirmed! So how did the toy train actually feel like? Scenic, no doubt! The picture below describes exactly what it felt like back in April 2016. There are quite a few tunnels which we had a good time hollering at during the journey but to be honest the entire thing gets boarding after the first two hours as you keep waiting to reach Shimla and the sequence gets pretty repetitive. The train runs at around 30-40 kmph and some turns may make the first timers say ooohh! Our overall experience was quite enjoyable. For people who get dizzy climbing up and down hilly areas, this is THE best way to reach Shimla as our friends who were with us during the train ride and have altitude problems, didn't face any such issues. So the comfort is unmatched compared to roadways. And well there aren't toy trains everywhere, so why miss it if coming to Shimla? We reached Shimla around five and half hours of departing. Reaching Shimla was exciting but we had our own challenges. We hadn't pre-booked a hotel, we didn't know how to navigate the city (particularly we were unaware that on the famous Mall Road vehicles aren't allowed!). On top of it all, one of our friends had forgotten his wallet, (YES WALLET!) at the loo at Kalka Station. How we sorted out things makes another great story which we'll share soon! Keep visiting us at www.ourtravelcravings.com and share your love for us by sharing this link with your travel-loving friends! By the way, The Shivalik express was not our ONLY toy train experience. Our awesome Matheran trip too had its toy train flavour which was an equally special experience, more of which you can read here. (Our Complete Guide to Matheran!). Out of few landmarks that paint the picture of Shimla. One old in existence, full of beautiful expressions, is Lakkar Bazar Shimla. The bazar consists of shops selling wooden items. GIve us a smile. Subscribe, Like and Share our blog! Read our Most Popular Posts! The Best Travel Apps in India – Guaranteed to make your travel planning pleasant! Exploring The Andamans - A long awaited trip! Planning a Goa Vacation? Here's how to make the most of it! Why you should experience Asia's Highest and Longest Cable car atleast once! Our experience at the Gulmarg Gondola. Shimla - The Queen of Hills! Welcome to OurTravelCravings. We are a travel loving couple from India. For us, travel is not only an escape from our routine and monotonous work life but also an opportunity to experience this big and beautiful world. Through this blog we share our experiences of our holidays. This blog also fuels our desires for future travels. And yes, we are not professional travel bloggers. Neither are we adventure junkies nor do we have that adrenaline rush to climb the tallest of peaks or dive into the deepest of the creeks. But we do strive to maximise our travel stories as much as we can with minimum possible budget. Hence, we are budget holiday travellers with a passion for photography and blogging as well. We love exploring different places, people, cultures, food and experiences..And perhaps that is why we love travelling! We have a long to-do list and we hope to tick most of them if not all, some day in the future! We would be excited to have you as a part of our journey through this blog. Feel free to subscribe, share, like! Copyright www.ourtravelcravings.com. Travel theme. Theme images by konradlew. Powered by Blogger.